A media event was held this morning. In the meantime, above are the important visuals, including a map of the impacted area, the detour map and a rendering of the Aviation/Century station that will be shared by the Crenshaw/LAX Line and the Green Line. Plan ahead, allow extra travel time or steer clear of airport-area traffic the weekend of July 25-28, 2014. These are the messages that the Los Angeles County Metropolitan Transportation Authority (Metro), the Los Angeles Department of Transportation (LADOT), Los Angeles World Airports (LAWA), and Caltrans are advising the public in advance of a major bridge demolition that will result in 57-hour street closure that weekend of a portion of Century Boulevard, a major artery leading into Los Angeles International Airport (LAX). DuBois noted that the demolition work is necessary at this time for Metro to stay on schedule for the new light rail line that will connect the Metro Green and Expo lines in 2019. 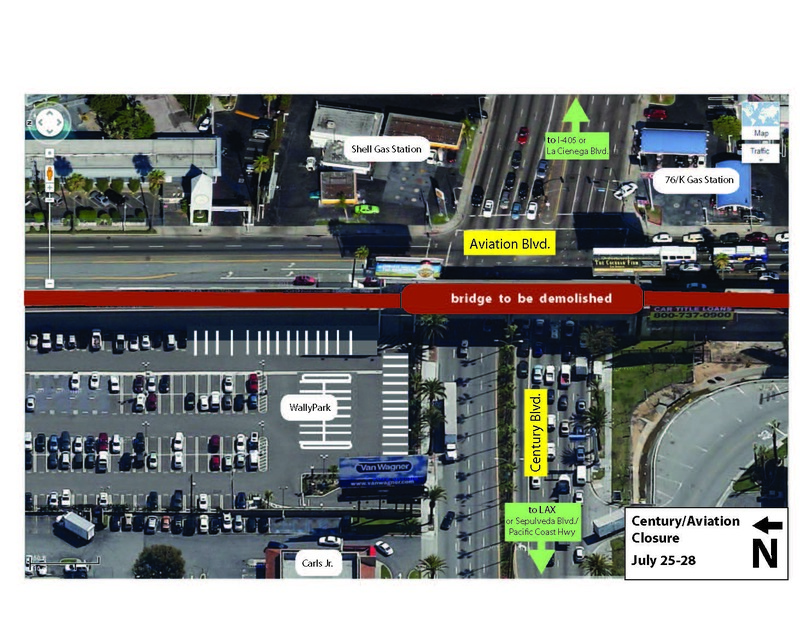 For the effort, dubbed the “Century Crunch,” Walsh Shea Corridor Constructors, a contractor working for Metro’s Crenshaw/LAX Transit Project, will demolish a defunct railroad bridge at the intersection of Century and Aviation boulevards from 9 p.m. Friday, July 25 until 6 a.m. Monday, July 28. The work is necessary to clear the site for a new light rail train station. Demolition will close a portion of Century Boulevard at the Century/Aviation intersection. The street is a major artery leading into LAX during one of the busiest travel times of the year. Supervisor Mark Ridley-Thomas speaking at the media event this morning. Photo by Juan Ocampo for Metro. Los Angeles Mayor Eric Garcetti flanked by Metro Board Chair Diane DuBois and Supervisor Mark Ridley-Thomas at this morning’s media event. Photo by Juan Ocampo for Metro. The “Century Crunch” will also reduce lane capacity on Aviation Boulevard by half. All southbound bound traffic lanes will be closed in the area, while Aviation’s northbound lanes will remain open. Motorists are advised to monitor real-time traffic conditions prior to beginning their trips and to follow recommended detour routes. 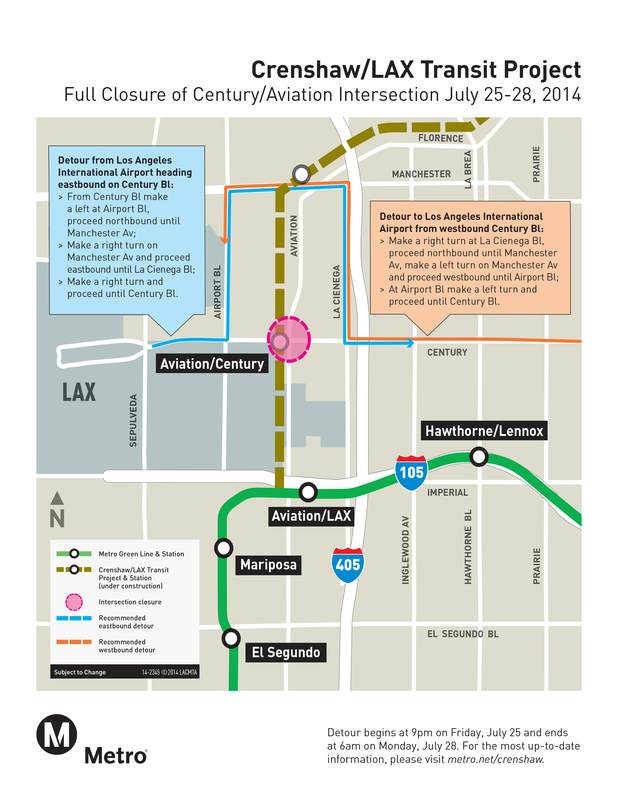 The detour area is approximately 1-mile between La Cienega and Airport boulevards. Westbound: For westbound traffic on Century Boulevard heading to LAX, motorists can head northbound on La Cienega Boulevard, turn left (west) onto Manchester Boulevard, turn left (south) on Airport or Sepulveda boulevard, and then turn right (west) on Century Boulevard to enter the airport. Eastbound: Leaving LAX on Century Boulevard, motorists should turn left (north) onto Airport Boulevard and proceed to Manchester Boulevard. Motorists can then turn right on Manchester Boulevard to proceed eastbound to La Cienega Boulevard or turn right (west) to proceed southbound to Century Boulevard. Travelers to and from LAX are not the only ones impacted. Employees of local businesses and hotel guests also will be affected. Metro and its contractor are conducting extensive community outreach in an effort to mitigate the closure’s impacts. As part of the traffic management plan, freeway message signs on the I-405 and I-105 freeways will advise motorists of street closures. On local streets, LADOT will monitor real-time traffic conditions in efforts to help keep traffic moving as quickly as possible. LAPD traffic officers will also be stationed at key intersections during the effort. Airport travelers are encouraged to use public transportation to access the airport, including the Metro Green Line. Passengers traveling to the airport should exit at the Aviation/LAX Station, and then catch the free ‘G’ Shuttle bus from Bays 6 and 7. The ‘G’ shuttle, operated by the airport, serves all passenger terminals. Metro Line 120 (Imperial Highway) also serves the Aviation/LAX Station. Metro Bus lines serving the airport include Lines 102, 111, 117, and 232. These lines all terminate at the LAX City Bus Center on 96th Street just east of Sepulveda Boulevard. Municipal providers with service to LAX on the weekend include Beach Cities Transit Line 109, Santa Monica Big Blue Bus Line 3, Culver City Line 6, and Torrance Transit Line 8. All four lines serve the LAX City Bus Center. Flyaway buses provide a one-seat ride to the LAX passenger terminals. Flyaway provides service on four routes connecting LAX to LA Union Station, Van Nuys, Westwood, and the Expo/La Brea Metro Rail station. To plan your trip on public transportation, visit metro.net and use the trip planner. Traffic will not return to normal after the bridge demolition is completed. For the next 16 months, one lane in each direction on Century Boulevard will be removed as the contractor builds infrastructure for a new elevated light rail station at Aviation and Century. This will leave three traffic lanes in each direction. The public is advised to continue to allow extra time when traveling through this area. 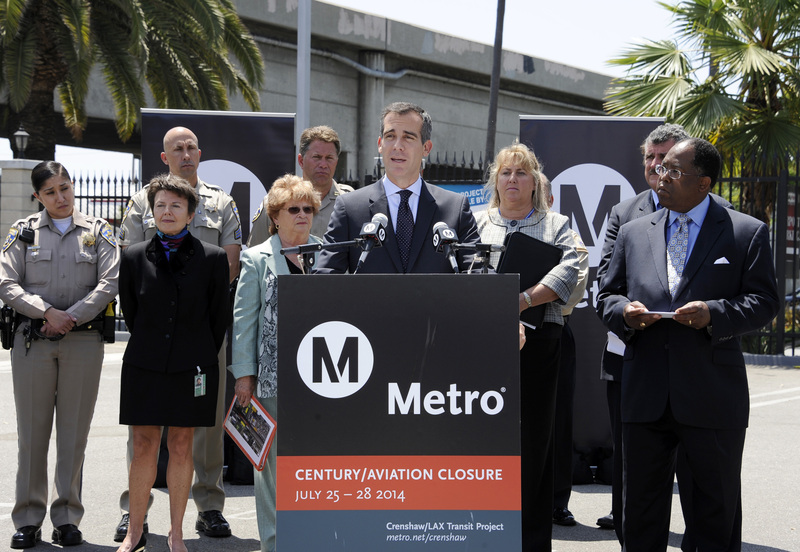 For more information on the Crenshaw/LAX Transit Project, the Century bridge demolition, related street closures and recommended detours go to metro.net/Crenshaw. Join us on Facebook at https://www.facebook.com/CrenshawRail and on Twitter at https://twitter.com/crenshawrail. Twitter at https://www.twitter.com/flyLAXairport and www.LAXisHappening.com for airport construction and traffic-related impacts. Metro is a multimodal transportation agency that is really three companies in one: a major operator that transports about 1.5 million boarding passengers on an average weekday on a fleet of 2,000 clean air buses and six rail lines; a major construction agency that oversees many bus, rail, highway and other mobility related building projects, and; the lead transportation planning and programming agency for Los Angeles County. Overseeing one of the largest public works programs in America, Metro is, literally, changing the urban landscape of the Los Angeles region. Dozens of transit, highway and other mobility projects largely funded by Measure R are under construction or in the planning stages. These include five new rail lines, the I-5 widening and other major projects. Suggestion: the overpass has an iconic Santa Fe Railroad sign which is pretty noticeable when driving underneath it towards LAX. I think that sign should be saved and be placed into the new light rail station as a memorial piece. 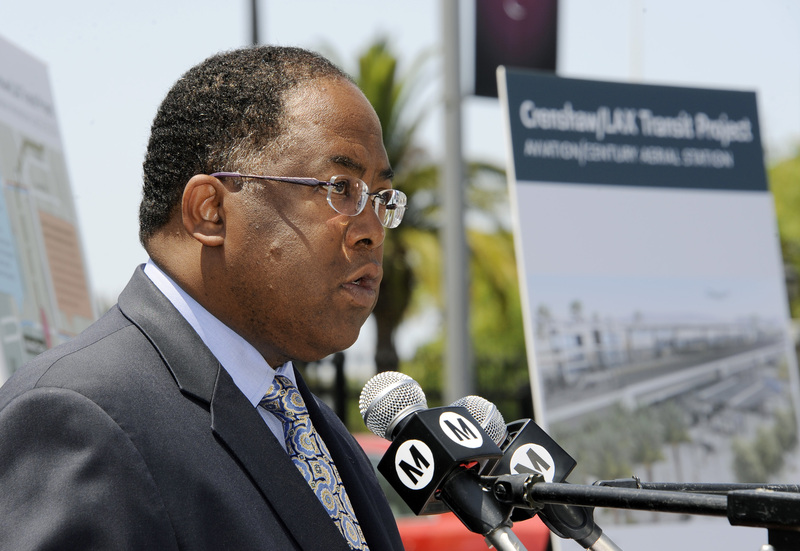 The news release, above, says: “For more information on the Crenshaw/LAX Transit Project, the Century bridge demolition, related street closures and recommended detours go to metro.net/Crenshaw”. This URL is not supported in the Metro Web site. Did you mean “metro.net/projects/crenshaw_corridor/”? If traffic will not be returned back to normal in the area. Metro needs to cleanup the stations and trains so that people can have a comfortable ride to LAX. LAX also needs to increase the frequent of the G Shuttle. I assume that the traffic police will be working your detour route to make it as smooth as possible. However, the easiest way to reduce traffic headache is PREVENTION. Anyone traveling South on I-405 (from the SF Valley or Westwood) should take one of these alternate routes: 1) I-405 (South) to R- Howard Hughes Parkway off-ramp; R- Howard Hughes Parkway; L- Sepulveda Blvd; R- 96th Street (Sky Way) (you are now in LAX); R- World Way. Or : 2) I-405 (South) to R- La Tijera Blvd off-ramp; R- La Tijera Blvd; L- Airport Blvd; R- Century Blvd into LAX. From the South, Orange County, Long Beach, etc: I-405 North to I-105 WEST; R- Sepulveda Blvd off-ramp; R- Sepulveda Blvd; R- Century Blvd/ World Way ramp; keep right: World Way ramp to World Way in LAX. Leaving LAX going South: World Way; South on Sepulveda Blvd; R- Imperial Hwy/ I-105 East on-ramp, keep left on the ramp for I-105 East; R- I-405. Leaving LAX, heading to the Northern areas, from World Way, follow signs for ramps to North- Sepulveda Blvd; R- Howard Hughes Parkway; I-405 North on-ramp; I-405 North. Or leave LAX via Century Blvd; L-Airport Blvd; R- La Tijera Blvd; L- I-405 North on-ramp; I-405 North. If everyone goes to Century Blvd and has to follow your 3-mile detour, it will be Carmageddon and World no-Way, combined. Yippee! 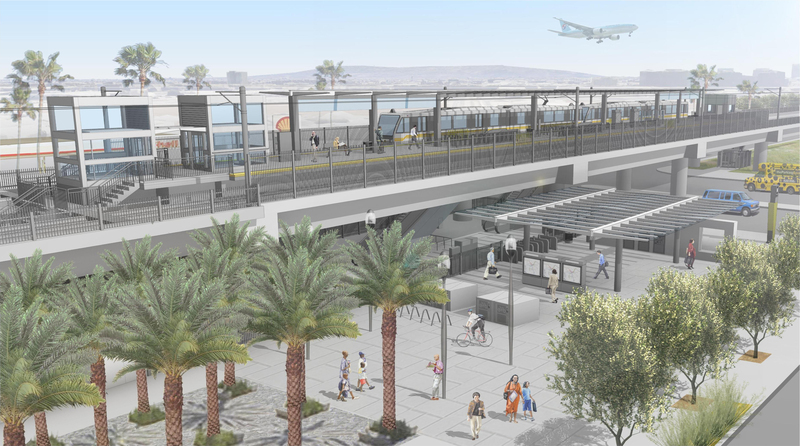 Finally, a rendering of one of the Crenshaw Line Stations. Any chance we can see more soon? I like LAX Frequent Flyer’s suggestion about incorporating the Santa Fe Railroad sign into the new station. Small nitpick, but can you correct the spelling in the second paragraph after the picture of Mayor Garcetti? It’s Angelenos, not Angelinos. You are correct. Will inform the communications folks! Thanks! +1 in the idea of saving the Santa Fe Railroad sign. There should be a small museum space in the new LAX station that should be dedicated in memory that this used to be an overpass for the old Santa Fe Railroad and photographs of how this place used to look before it was demolished. Would be a great place to showcase the sign there. And just a few blocks down the road, there’s the Proud Bird restaurant which itself is like a museum of old photographs and memorabilia of when LA used to make aviation history. Rail and air travel needs to go together, why not share the same history too? I like Theo’s idea of the small museum space in the new LAX station. Some travelers have long delays or layovers. A quick trip on the people mover to the station Just getting out of the terminal, doing some walking along with the fresh air would do a person good. Like the museum space idea. It’s time train stations did more than just being a train station. If you go to train station in other cities all across the world, they utilize train station to full potential, filled with restaurants, places to shop, art galleries, it’s like a shopping mall right there. LAX station has the opportunity to become a Union Station for the Westside. It needs to be built with expansion in mind. Planes occasionally — depending on winds — take off toward the city and land from the direction of the ocean. That said: good eye, Brigitte!